home > agritourism > the apartments > flat "Vista"
Two levels. Open loft. Airy and bright. View of vineyards. This is a very scenic apartment. At the first level there is a large living room with kitchen and bathroom, at the second level the bedroom is under the eaves of the roof. The ceiling is made of wood with exposed beams and the floor of the loft consists of a solid wood planking. The railing has a view of the living-room below. The apartment is exposed to the south, with a view dominated by the garden and vineyards. The distribution of space gives this apartment particular brightness and interesting perspectives. The mix between modern furniture and rustic details recovered from the old structure (the original bricks, oak beams, etc.) is very pleasing. First floor – 70 sq. meters - Comfortable suite on two levels comprising a large living room with kitchen overlooking a large terrace with views of vineyards, two bedrooms and two bathrooms. Second floor – 60 sq meters - Welcoming top floor apartment with exposed beams and an average height of 3.80 meters. Large living room equipped with kitchen. bedroom and loft of 15 sq. meters, useful as a second chamber, or space for recreation, study or work. 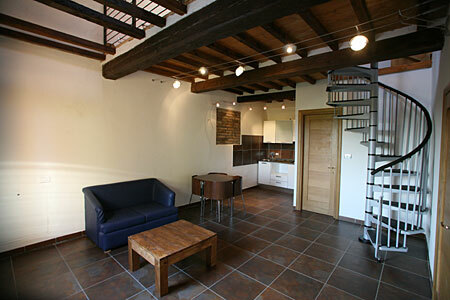 Ground floor – 50 sq meters - Grand studio in the old barn that preserves the original look. Large bathroom and independent access, directly from the garden.